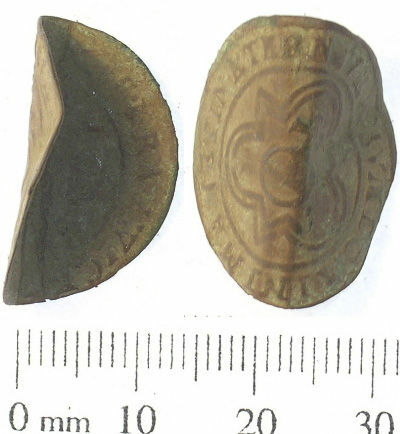 A copper alloy jetton or reckoning counter dating from the post medieval period. The jetton is bent at a right angle across the centre. It has a diameter of 24.1mm and is 0.7mm thick. It is a German jetton made by Hanns Kravwinckel II (1586 – 1635), Rose and Orb type. The obverse deign is illegible. For reference see Mitchiner (1988) Volume I, number 1516. The jetton was found in Yorkshire.